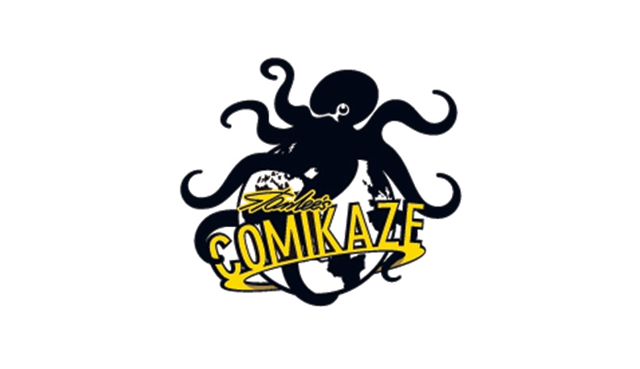 This year, I had the pleasure of attending Stan Lee's Comikaze Expo and it was my first proper time attending, as last year I had only popped into the con in the latter half of the last day. It was terrific fun; here's the run-down of all the things I got up to! After picking up my 3-day badge, the first thing on my to-do list was to figure out how to go about meeting Stan Lee. 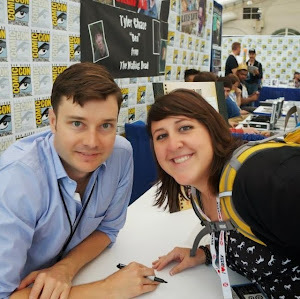 Having previously gotten photo-ops with him at SDCC cons, I wanted an updated one since my love for Marvel had been reinvigorated and Stan The Man had gotten sick during SDCC 2014 and cancelled the ones he had planned on doing then. I checked his booth and found out he'd be doing signings throughout the weekend and also photo-ops at the Froggy booth. I decided the best course of action would be to do the photo-op on Friday evening and then a signing on Saturday so he could sign my printed copy. Both the autographs and photo-ops for Stan were far more expensive in the past, but this was only due to the fact that he is now making less appearances than he used to. Honestly, it's still impressive how busy he keeps and the effort he continues to make that time for his fans. So I queued up for the photo-ops and found that the wait was much shorter since less people turn up on Fridays. Another benefit to going on Fridays is that you have time to scope out different booths and get information on any potential signings you might be interested in. When it was my turn to do my photo-op, I popped in and said hello as I was walking up and Stan Lee said hello back. I cozied right on up and put my arms around him, to which he responded with the cheekiest of "Oh boy! "s, and the photo was snapped. Photo-ops tend to be quick so if you're looking for more of a longer interaction, it might not be the best use of your money. But this is Stan Lee we're talking about so he's worth every penny! First thing in the morning, I headed out to the convention centre and it was raining a bit. A little tip for all con attendees (not just for Comikaze) is to check the weather in advance, particularly if you need to make accommodations for your cosplay or if you're simply someone that needs to make sure they use their waterproof eyeliner. Comikaze's nowhere near as hectic as something like SDCC, so unless there's something exclusive you have to get, you don't need to worry so much about going hours in advance to wait in the queue before the doors open. One problem the event had this year was that despite the queue they had set up, upon actually opening things up to let people in, the order was disregarded and it became a free-for-all as people swarmed inside. After meeting up with a friend who would be spending the day with me at the con, I began having her the run-down of what I would be doing and filling her in on the things I had learned from going through the show's website in advance as well as the night before. Though she already had purchased a photo-op with John Barrowman, she opted to also get one with Stan Lee ("It's Stan!") as well as the Battlestar Galactica trio (Edward James Olmos, Michael Trucco, Jamie Bamber). After doing her photo-ops with Stan and BSG, we headed to the Boom! Studios booth where I would be doing the "Cloaks" signing with the series creator David Henrie and series writer Caleb Monroe. The signing began half an hour late, thanks to David, which I jokingly poked at him for. Both he and Caleb were nice to everyone and David posed for photos with everyone that asked. He even offered up doing an extra one with me "because you waited." Then my friend and I ran back to Froggy to queue up for John Barrowman's photo-ops (this was the reason why I was anxious about the signing starting late - I didn't want to miss my photo-op with Captain Jack!) I had done a photo-op with John before but my friend hadn't so I encouraged her to not be afraid to ask to do any silly (or well-cheeky) pose she might want to do, as this is a signature of John's. He's game for just about anything. As my last one with him involved him groping me, I wanted to mix things up by having something a little less risqué and more cute so I asked if he would dip me. He was ever the pro, and instructed me to face him, then put a hand on one leg and said to put all my weight on it, dipped me backwards and lifted my other leg up in the air. It all happened quick as lightning but the photo was indeed cute, just as I'd hoped. Peter Facinelli was also late but he was still nice as you'd expect and shared how he was just a week away from beginning filming for the upcoming "Odyssey" series on NBC. Following this, it was time to run off to get in the queue for Stan Lee's signing, which we ended up waiting in for hours. But it was all worth it once it was my turn. No one else in the immediate few in front of me had said a word to Stan but when I was the one in front of him, I thanked him for taking the photo with me, to which Stan replied, "Thank YOU for posing for it with me!" I then said, "Thanks for making Black Panther; I'm REALLY excited for the film!" Stan responded gleefully, "Me too!" Fangirling with Stan Lee is something you just can't put a price on. 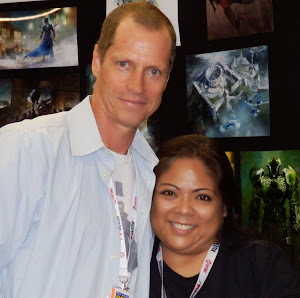 Once this was over, the last order of events was stopping by Jamie Bamber and Michael Trucco's booths so my friend could say hello and thank each of them for the photo-op. I also snagged a photo with Michael Trucco. What was nice was that some of the celebrity guests signing at individual booths had the option to just purchase a photo with them, which was cheaper than buying an autograph. This is a good deal; they often have to charge more for autographs because there's that possibility that a person is buying for the purpose of flipping it (selling it at a higher price). Both Jamie and Michael were lovely so I'd absolutely recommend taking time to meet them if they're at a con you attend. The final day of the con was far calmer. The first order of events was to head upstairs to attend the panel for FOX's "Gotham," at which they screened the episode that would be airing the following day, "Penguin's Umbrella." The episode was one of the best of the season (so far) and was both exciting and full of funny moments. After a quick Q&A with a producer of the show, at which they teased that the show will be introducing and exploring Scarecrow and Scarecrow's father. We also each got passed out exclusive badges/lanyards of the show. Next up was a panel for a horror film (that has been commissioned to be a trilogy), called "Muck." I was most impressed by actress Puja Mohindra, who shared some brilliant words about supporting the film for its non-cliched portrayal of a POC character and how it's up to us as viewers to show the industry folk that we will support diversity in media (and pay money for it). The reason why I saw this panel was because I was waiting for the "Sleepy Hollow" panel, another show sent by FOX. Sadly there were no cast members in attendance. Instead, there were three writers and/or producers. The episode "Deliverance" was screened and it was just awful. There was a Q&A and I took the opportunity to ask about certain choices regarding season 2. There wasn't a whole lot more I did with the day, but I was delighted to run into Osric Chau on the floor. He was done up in a Pikachu costume, complete with a yellow knit beard covering half his face. I still recognised him, though. Most amusing for me was when a random con attendee stopped to ask him for a photo, simply because of his costume and not realising who it was that he was speaking to. But I were happy to speak with him again, as Osric is an absolute delight. Overall, the con was great fun and I'd gladly attend again. The food trucks outside are indeed expensive so if you want to budget more meticulously, it's better that you bring along some food and water of your own. I must confess that the Japanese food truck was my personal favourite, as their honeydew green tea was irresistible and the freshly made boba was some of the best I've ever had. I also enjoyed the opportunity to use my native tongue with the lady running the register; made me feel more at home!